After the wedding, many brides take their dress to be dry cleaned, put in a box and preserved for the future. Maybe a daughter will wear it? Maybe it will be worn at a ceremony renewing vows? Other brides (like myself) don’t feel the need to hold on to the dress and look for other ways to make use of the (sometimes) expensive piece of clothing. A more recent trend in post-wedding photography has given brides an interesting alternative. As you can see from the photo above, the new trend is to essentially “trash” the wedding dress in hopes of creating a piece of photographic art. This trend has allowed many brides and photographers to use their imagination finding new ideas for photos. A common theme (shown below) involves water. Whether it is the bride alone, or the couple together in the water, this seems to be a popular idea. However, if you choose to do something like this, keep in mind that if your dress is heavy out of the water, it is going to be REALLY heavy in the water making it difficult to stay above water (in other words, don’t go in too deep). A fearless bridal photo session is sometimes confused with a trash the dress session. A bride who wants a fearless bridal photo doesn’t necessarily want to ruin her dress. Instead, she wants to have a fun photo without having to worry about the fact that her dress may get dirty or torn. She wants to be daring or different like in the photos below. See more photos on my Pinterest board. It would be great if you followed me while you are there! 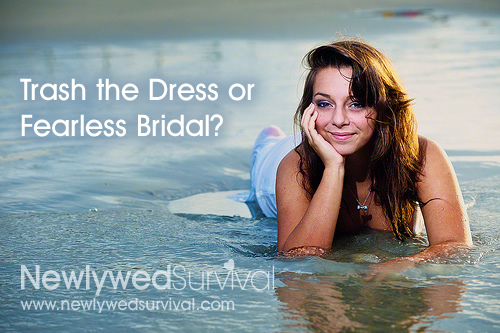 So, would you be more likely to do a trash the dress photo session, or a fearless bridal photo session? Or, do you think they are both crazy? I dry cleaned mine...it's sitting in a box. I plan to have it shortened and dyed to wear on our 10th anniversary. Who know what will happen to it after that! That's a cute idea! I don't know if anything could be done to mine to update it like that. It's beads and long sheer sleeves. Trashing the dress doesn't seem like a good idea to me. You never know whether you may want the dress for some reason in the future. But I really like the fearless photo concept. I think that can be done without permanently ruining the dress. Still, no matter what happens, in the long run it is just a dress. The bride should be able to have fun with it. My wedding dress was two pieces, a long slim skirt and a beautiful, elaborate lace blouse. At some point I donated the skirt, but I still have the blouse. It's possible that I will wear it someday as part of a major anniversary celebration. Wonderful ideas! Mine was homemade and had the big puffy sleeves to the elbow then tight fitting down to the back of the hand. I really don't know why I kept it because not one of my three daughter wanted to use it. an really who could blame them. I love the pretty bridal dress designs of today. I love the colors splashed on that one dress - I would wear that! I really love how the one with the paint turned out, although I don't think I would ever be bold enough to do something like that. I would totally do a trash the dress session. That underwater photo is amazing! The Trash the Dress idea sounds like something I'd love to do! Mine's been in the back of my closet since our wedding day. What a neat way to be artistic!! That's a good question! I have my dress (not preserved like it should). I know The Girl will not want to wear it. My thought is one day I want to cut it up and make handerchiefs for my son and daughter to carry as the something old part when they marry. I have thought about this a lot. I actually have two wedding dresses since the first choice I got too big for before my wedding! I was saving it for re-vows and since I had two boys and two dresses I figured it would be a great passer-on... but I would love to do the trash the dress photos! they look so amazing. ugh. i am always conflicted. This is such a liberating idea! Wouldn't it be cool for the bride and groom to "trash" their outfits during something super-awesome like a wacky beach clean up with a well-dressed crowd for an anniversary? Life creates wear and tear on the body. Why not allow good deeds to "re-shape" the gown and tux. It seems like a beautiful idea to "trash" the meaningful outfits with another "do good to feel great" adventure together.